Leftists in Canada Want Voting Age Lowered to 16. Here’s Why. Of course, comparing women’s suffrage to the voting age is an absurd apples-to-carrots comparison. The argument for the former is equal rights to all citizens. The latter is a subject of having voters be of appropriate maturity and understanding to make complex socio-economic decisions when marking a ballot. There’s no sound argument for not letting women vote, there is however a pretty good reason that we don’t allow children to vote. To answer the question: “Why does Don Davies want the voting age lowered to 16?” we have to look at 2 more broad questions. What existing problem is this trying to solve? Is lowering the voting age the best solution to that problem? Davies says that “lowering the voting age will set the tone for young people to continue voting throughout their lives.” Davies really answers both questions here. According to him, the problem is voter turnout. The solution is lowering the voter age, getting even younger teens to mark the ballot, and thus setting precedent for them to continue doing so their entire lives. By this, of course, Davies means that he met a bunch of teenagers who were “feeling the Bern” – that is to say, have embraced the false promises of socialism, and agree with every nuanced left-wing policy that Davies subscribes to. Not surprising, as Vancouver hasn’t elected a Conservative mayor since 1938. In any event, I would argue that Davies’ underlying agenda has nothing to do with simply “setting a tone for young people to continue voting through their lives,” but to increase votes for the left. And the data supports this claim. Here are the votes for the last 2 elections, broken down by age group. 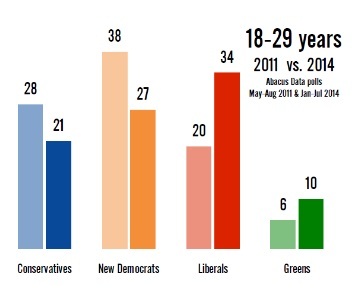 As you can clearly see, the Liberals and New Democrats do far better among young voters than the Conservatives. In 2011, the NDP absolutely dominated the youth demographic, while strategic voting in 2015 swung the entire youth vote into the Liberal Party. In fact, MPs from the Liberal Party have already come forth and supported Davies’ efforts in having the voter age lowered. Shocker. This is, however, understandable. Young voters are less likely to understand the difference between being compassionate with one’s own hard-earned money – and being compassionate with someone else’s hard-earned money. It’s far more likely for young voters to hear policy proposals from the left such as: increased entitlement programs, higher minimum wage, rent control and immediately jump on board the big-government bandwagon than it is for them to the analyze the short and long-term economic outcomes of such programs, including their effects on not just one group, but on all affected groups – and then base their decisions on the effects of the policies, rather than their intentions. Thus, the notion that Davies, the left-wing MP from Vancouver so passionately wishes to increase voter participation for the good of country is just untrue. He wants more votes for the left and to keep conservatives out of Ottawa.